Today we will be checking out an often unfairly overlooked prehistoric fish. Enter Belonostomus! Belonostomus was a ray-finned, or bony fish, that lived in many parts of North America and Europe through much of the the Mesozoic Era. It was wildly successful, the oldest species of this genus are from the Jurassic, about 150 million years old, and the youngest to date are all the way past the end of the Cretaceous, into the earliest part of the Paleocene, 59 million years ago! Belonostomus on average tend to hover between a foot to almost two feet long from snout to tail, depending on the individual and species, of course. On the other end of the size spectrum, there are Belonostomus specimens that are only about an inch long, which may have been adults. (Unfortunately their skulls were too damaged to identify if they were, in fact adults or juveniles at the time of their deaths.) The name, Belonostomus, translates to "Big Long Mouth" because...well, look at its mouth! My life reconstruction of a still unnamed species of Belonostomus. This painting was commissioned by Nathan VanVranken and featured with his recent research, presented at the 2016 Society of Vertebrate Paleontology meeting. When alive, Belonostomus would have been a meat-eater, probably using its long, thin snout, lined with small, pointed teeth to shred smaller fish and other aquatic prey. Its long, streamlined body, which was a characteristic of a fast-swimmer, also probably aided it in hunting. Being medium-sized for a fish, it also probably had to worry about getting eaten by larger predators from both the water, like larger fish and marine reptiles, the air, in the form of pterosaurs, and probably even dinosaurs, like Baryonyx. Belonostomus muensteri specimen on display at the Museum für Naturkunde in Berlin, Germany. Modern Needlefish, which share a family with Belonostomus, look similar in many ways to their prehistoric relatives, and provide a decent modern analogue when imagining what Belonostomus might have been like when alive. Close up of the teeth and jaws of Belonostomus sp featured in Van Vranken's 2016 research. What is interesting about Belonostomus, is the fact that it is known from several really well preserved fossils, that range greatly in time, as stated above. In fact, we can tell a lot about how both marine, and freshwater ecosystems were forming thanks to the presence of Belonostomus fossils. And, yes, it is likely that Belonostomus could be either a fresh or salt-water fish, depending on the exact species. Kogan, Ilja, and Martin Licht. 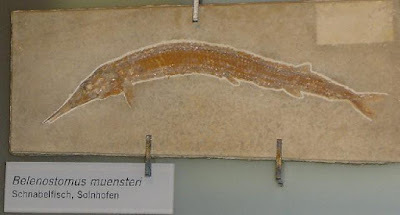 "Erratum To: A Belonostomus Tenuirostris (Actinopterygii: Aspidorhynchidae) from the Late Jurassic of Kelheim (southern Germany) Preserved with Its Last Meal." PalÃ¤ontologische Zeitschrift 89.3 (2014): 671. Web. 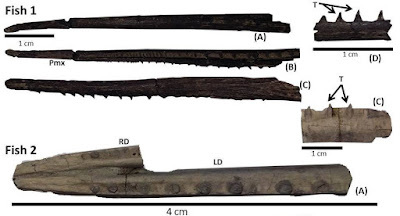 Van Vranken, N., Fielitz, C. BRIDGING THE GAP: THE BIOSTRATIGRAPHIC RECORD OF THE GENUS BELONOSTOMUS WITH NOTES ON NEW OCCURENCES IN TEXAS AND MEXICO. : Journal of Vertebrate Paleontology, Program and Abstracts, 2016. 242pp. Woodward, Arthur Smith. "Genus BELONOSTOMUS, Agassiz." The Fossil Fishes of the English Wealden and Purbeck Formations (n.d.): 100-01. Web.